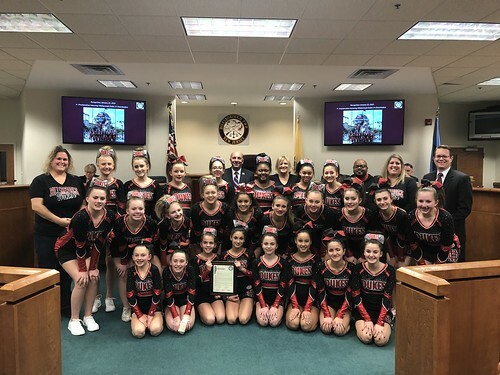 At the January 22nd Township Committee Meeting, the Mayor and Township Committee recognized the Hillsborough Dukes JV Cheerleaders for their successful season and for their hard work, dedication, and commitment to the sport and to those principals of good sportsmanship, teamwork and academic achievement which the organization endorses. The 2018 Hillsborough Dukes JV Cheerleaders achieved Jersey Valley Conference Grand Champion, NJ State Grand Champion and Pop Warner National Finalist. The Hillsborough Dukes scored among the top 5 Pop Warner teams out of 534 teams that attended the Pop Warner Cheer and Dance National Championships. The 2018 Hillsborough Dukes JV Cheerleaders consisted of the following young athletes: Keyonie Black, Hannah Fields, Ashley Figliolo, Emily Florek, Natalia Fonzetti, Amanda Gianetti, Abigail Glazewski, Abigail Grouss, Carly Janaszik, Bella Johnson, Kayla Kirk, Maya Lewis, Sonia Lips, Emily Margelis, Olivia McCarthy, Sophia Mistretta, Jozlyn Miranda, Marissa Morris, Melanie Muriello, Kaitlyn Oram, Abigail Patula, Grace Perkins, Alyssa Petti, Reagan Pirog, Taylor Regenye, Alexis Scott, Ariel Shvetz and Makaylah Williams. The squad was led by Head Coach Noelle Fonzetti-Creekmur, Assistant Coaches Kelly Black, DeShaun Creekmur, Nicole Figliolo, Dana Margelis and Danielle Scott and Junior Coaches Juliette Benedetti, Samantha Compell and Hailey Doyle.